Basic colour: Head legs and body black, pronotum and elytra red. First recorded in Britain in 1839, expanded its range especially since the 1980s. Widely regarded as a garden pest. 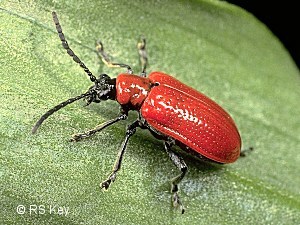 See the Lily Beetle Survey here. Status: Widespread south and east, spreading west and north. Habitat: Gardens and plant nurseries. Host plant: Various Liliaceae, especially Lilium and Fritillaria. Overwintering: As adults in sheltered places e.g. soil, not necessarily near food plants. Food: Liliaceae leaves; once leaves are consumed, late-instar larvae may consume remaining buds, flowers and seed capsules. Other notes: Eggs 1mm long and orange-red. 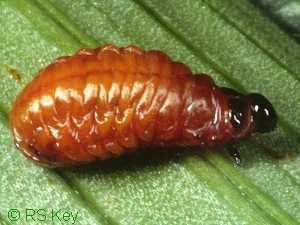 Larvae orange with black heads, though usually covered with their own slimy black excrement; 8-10mm long when fully grown. Pupation occurs in the soil. Sinclair, M. (2009). Lilioceris lilii (Scopoli) (Chrysomelidae) in the Scottish Borders. The Coleopterist 18(3): 157. Salisbury, A. (2003). A further note on the continued spread in Britain of the Lily Beetle Lilioceris lilii (Scopoli) (Chrysomeldiae), with notes on its host plant range. The Coleopterist 12(2): 67. Anderson, R. & Bell, A.C. (2002). A first record of the Lily Beetle Lilioceris lilii (Scopoli) in Ireland (Chrysomelidae: Criocerinae). The Coleopterist 11(3): 90. Cox, M.L. (2001). 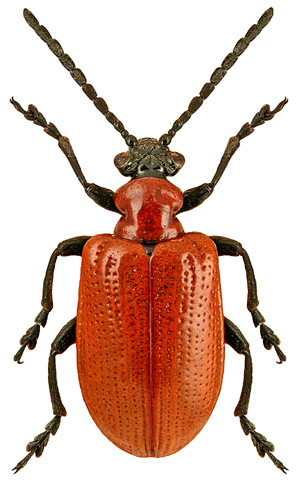 The status of the Lily Beetle Lilioceris lilii (Scopoli, 1763) in Britain (Chrysomelidae: Criocerinae). The Coleopterist 10(1): 5. Preddy, S. (1999). Lilioceris lilii (Scopoli) (Chrysomelidae), new to the Bristol region. The Coleopterist 8(3): 116.